Woodpigeons feed on grains, fruits, seeds, peas and beans, root crops and the occasional invertebrate (3). Courtship displays involve birds flying fairly high before clapping the wings together and gliding down, as well as males strutting and fluffing out their chest feathers (3). The male brings nesting materials to the female, who builds an untidy platform-like nest, usually in a tree, before laying 2 white eggs (3). 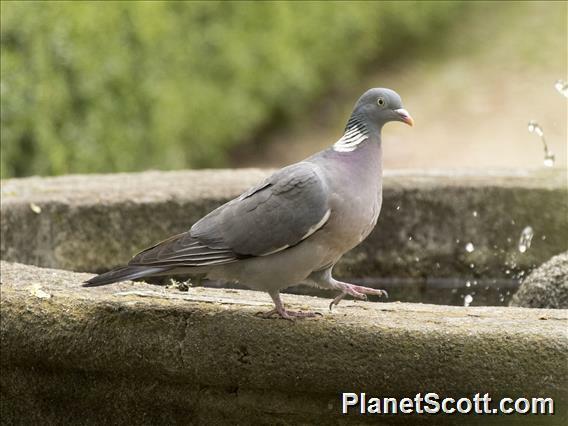 Both sexes incubate the eggs for around 17 days; they then feed the young (known as squabs), on 'pigeon milk', a regurgitated milky substance from a food-storage organ called the crop (3). The squabs fledge 29-35 days after hatching (3). Probably, very common in parks, but notes are lacking.